Source: Von Unbekannt. Scan by User: Gabor - Bibliothek des allgemeinen und praktischen Wissens. Bd. 5" (1905), Abriß der Weltliteratur, page 46, Gemeinfrei. 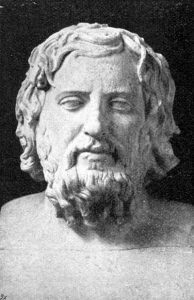 Xenophon can be considered the founder of hippology, the doctrine of horses and riding. He was the first to examine the relationship between man and horse from a scientific point of view. Xenophon demanded a deep and well balanced seat even that time. Quote: "I do not approve of a seat which is similar to a man sitting on a chair”. Salomon de la Broue, another great French "écuyer", who has almost sunk into oblivion. His great aim was to maintain lightness or "légèrité" in the art of riding. Quotation: “Lightness in the mouth is a prerequisite for the overall lightness of the horse”. He wrote the first remarkable French book about horsemanship in 1593 “Le Cavalerice Francois” He introduced the concept of yielding in the poll and lower jaw. He was against too much use of spurs. However, like many “écuyers” of his time, he depended on the generosity of his royal favourer. Unfortunately luck evaded him in this respect and he died in total destitution. In contrast to de la Broue, Antoine Pluvinel found himself in better social circumstances. Like de la Broue, Pluvinel was also an advocate of humane horse training. He is also considered as the inventor of the pilars, which he regarded as aids to judging character and movement without the weight of the rider and to make not only the poll supple, but also the hind legs. 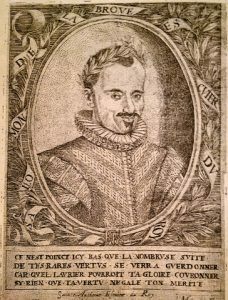 His remarkable book „L´Instruction du roy en l´exercise de monter a cheval“ published after his death in 1625 in Paris - a dialogue between him and his royal pupil - helped him to the title “Father of French horsemanship”. 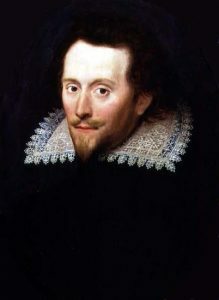 William Cavendish, Duke of Newcastle, today he may be described as the most underestimated equestrian trainer. Especially in his home country he never received the acknowledgement he deserved. He often was quoted in incomplete terms and his respect for the horse was completely ignored. 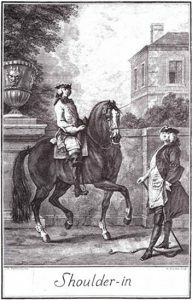 However Newcastle was an “écuyer”, who rejected any form of violence towards the horse and abhorred the cruel nosebands of the Italian school as well as martingales. It was indeed Guérinière who processed the doctrines of Newcastle as well as of La Broue further, and expressed them in a more comprehensible way. He wrote a great book "A General System of Horsemanship“ - and this book, incidentally, is one of the few still available today (for an appropriate sum of money!). Guérinière and shoulder-in on the track is something with which many people are familiar. Studying his theories makes it possible to arrive at the conclusion that he performed shoulder-in on four tracks. The Fédération Equestre International (F.E.I.) stipulated a 30° angle rather than specifying the track. Most dressage riders, however, interpret the modern rules to require an exercise on three tracks. Incidentally it was Guérinière, who first acknowledged that it was the English Duke of Newcastle who invented shoulder-in on the circle and Guérinière clearly defined the significance of the outer rein. 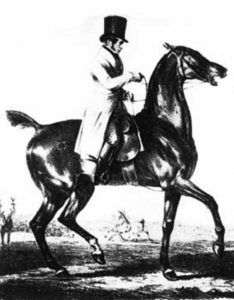 Guérinière was also the person responsible for the definitions of the lessons pesade, piaffe and passage, which still apply today at the Spanish Riding School in Vienna. Dom Pedro de Alcantara e Meneses, IV Marquies of Marialva, also known as the “Guérinière of the Iberian peninsula”. I.e. he also developed a method ensuing from which the positive elements of the past were united. His objective was lightness of movement, the power of which comes from the hind legs. 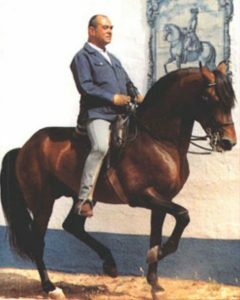 His permanent contribution to modern classical horsemanship is to be found in a ten-volume publication called “Luz da Liberal e Nobre Arte de Cavallaria”, many sections of which were written in close cooperation with his top student Manuel Carlos Andrade. He is considered to be the person who established set written rules relating to bullfighting on horseback (Rejoneo), and these rules still apply today. 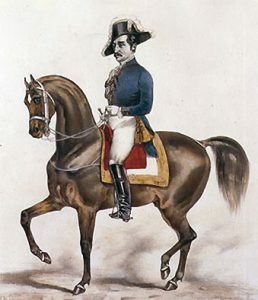 Marialva was in charge of the Royal Riding School in Belem Lisbon and of the stud farm “Real de Altér” from which the breed of the same name “Altér Real” originates. Dupaty de Clam: if you have never heard this name before, this is certainly perfectly excusable. 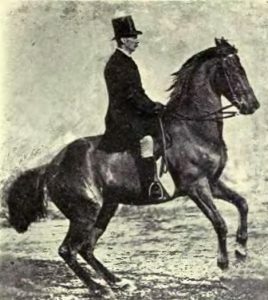 In his principal publication "Theorie und Praktik der höheren Reitkunst“ (Theory and Practice of the Advanced Art of Riding) he actually follows on from Guérinière's writing, i.e. he goes deeper from a scientific point of view but also explains things in a more practical way. Yes, you are quite right: in principle this publication is an intensification of the statements made by Guérinière. Louis Seeger’s guiding principle was: “Never forget, that locomotion (the forwards movement) is the very soul of equestrian art and the thrust required for this comes from the horse’s hindquarters”. Seeger was Steinbrecht’s instructor. 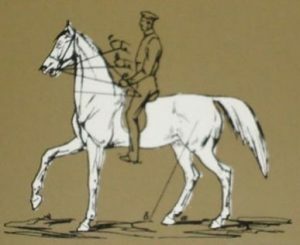 In his book "System der Reitkunst“ (System of Equestrian Art), which was published in 1844, he indicated that the horse’s natural crookedness is due to the narrower shoulders as compared to the broader hip. Colonel Podhajsky, Director of the Spanish Riding School in Vienna, later expressed his agreement with this theory. Nevertheless Seeger also stated that Baucher would be the “gravedigger of French horsemanship”, which naturally is a statement which is not tenable and an example of how Baucher’s doctrine was misunderstood. Francois Baucher, just as Xenophon, Newcastle and Guérinière was an advocate of the deep classical seat, of the light hand and recognized the significance of yielding, the „descente de main“. He introduced the flying change from stride to stride, the change "à tempo". It was Baucher who wrote “Walk is the mother of all gaits” and “The horse’s mouth is the barometer of the body”. 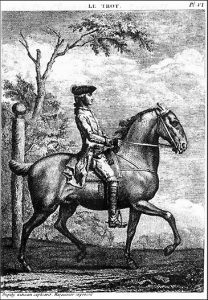 He also became well known for bending the head and neck in-hand in order to eliminate the resistance which hinders the horse’s collection (ramener). With these exercises he also attracted criticism. Principally on account of the fact, however, that many rider colleagues tried to reproduce this exercise on the basis of sheer force and – naturally enough – succeeded in achieving the opposite effect. Baucher's passage, piaffe and levade were exceptional! 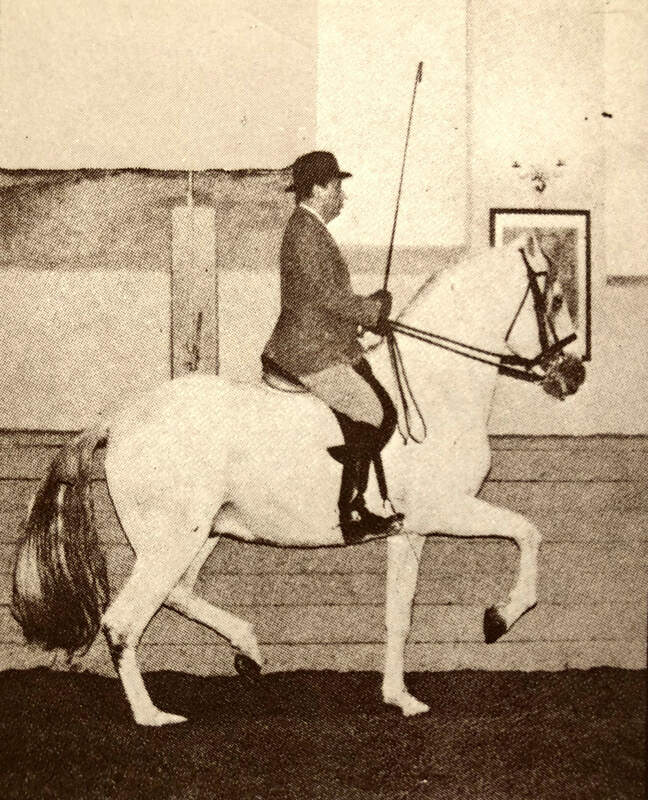 In many ways he established a connection between classic equitation and equestrian circus entertainment. In 1833 Baucher wrote his first book "Dictionnaire raisonné d`equitation“ and in 1842 he wrote his second book "Methode d`equitation basée sur de nouveaux principes". Unfortunately he was not very good at verbalizing his thoughts and therefore was unable to convey his unique wealth of experience comprehensibly to his readers. Consequently his work often was misinterpreted. 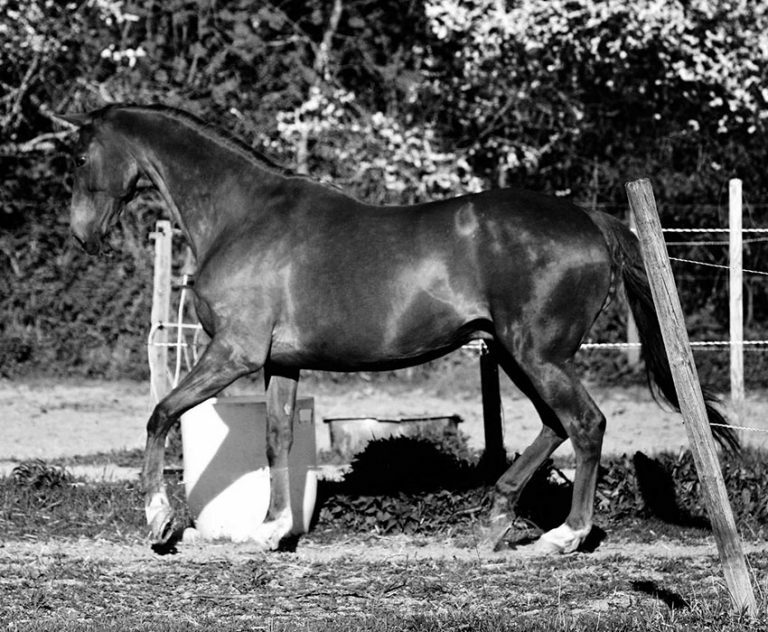 In contrast to Seeger, E.F. Seidler was a strong supporter of Baucher although he rejected certain exercises such as cantering backwards. As head of the military school in Schwendt he published the book "Leitfaden zur gymnastischen Bearbeitung des Campagne- und Gebrauchspferdes“ in 1837 and the book "Die Dressur diffiziler Pferde“ in 1846. 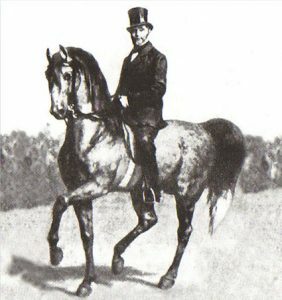 As Pluvinel is considered the "Father of French horsemanship", Gustav Steinbrecht is to be considered the "Father of German horsemanship“, a classic master of the old German school. His guiding principle, which Colonel Podhajsky used for the Spanish Riding School in Vienna, “ride your horse forward and set it up straight” still applies today. His book "Das Gymnasium des Pferdes“, which was first published 1884, became standard literature for classic riders in Germany. Steinbrecht was the best of the three “S” (Seeger, Seidler and Steinbrecht). He considered the use of spurs just to be suitable as a little touch for purposes of accurate execution of a certain movement, not for permanent use, as can be observed so often today. He had tremendous appreciation of the sequence of movement and interaction of the muscles. 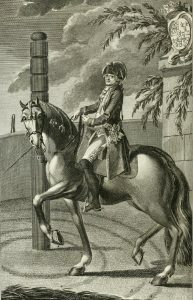 This is clearly demonstrated in the statement “Both yielding at the poll and suppling up of the hindquarters go hand in hand” or the comment on the counter canter “… that here we have an emphatic medium with which to contract the horse within itself.” As far as Steinbrecht was concerned, légèrité was never to be at the expense of straightness or impulsion. It is worth remembering that Steinbrecht, as well as Baucher and Fillis, were involved with circus equestrianism. Like Newcastle, James Ellis was a nearly forgotten, unrecognized genius of his time and a successor of Baucher in terms of taking interest in horsemanship and public equestrian circus entertainment. Fillis received equestrian instruction from various persons including a pupil of Baucher – Francois Caron. Fillis was a serious advocate of the classic principles of collection and légèrité, or lightness. Fillis improved and perfected the work which Baucher had started, no other author had explained the term collection so clearly before. Furthermore he reinforced the fact that driving with the legs and keeping them still should also be done with as much care as the taking in and yielding of the hands (descente de jambes). He achieved fame in his circus presentations with cantering backwards and on the spot, but, especially in Germany, these exercises had a negative effect on the image of this genius. Like many of his rider colleagues, Fillis was a so called “workaholic”, he is reported to have ridden 16 to 17 horses a day. He was promoted to colonel of the cavalry school in St. Petersburg in 1890. His book, published in Paris in 1890, „Breaking and riding“ was a distinguished work of reference at the time and indeed still is today. Even the fact that this book was published anonymously by Georges Clemenceau, probably in close cooperation with Fillis, does not do any harm to this publication. After the end of the second world war, Egon von Neindorff founded the Egon von Neindorff-Institut in Karlsruhe where, in the historic indoor riding school, he trained horses and riders according to the principles of classical equestrianism until his death in 2004. As a pupil of as famous riders as Felix Bürkner, Otto Lörke and Alois Podhajski, he placed great emphasis on extremely subtle application of the aids and an attentive horse in self-carriage. Egon von Neindorff brought numerous horses on to haute école level and, by training talented young riders from Germany and abroad, he made a major contribution towards the preservation of classical equestrianism. In this context the absolute focus for the great horseman Neinhoff was always on respectful dealings with the horse. The following statement lends special emphasis to this fact: “If your horse makes a mistake, look for the reason in yourself first of all. And, if you don’t find the reason, just look a little deeper." In the opinion of Egon von Neindorff, horses up to the age of six years were considered young horses, which is why he turned his back on modern dressage sport - despite the fact that he was the person who revived the competitive scene in Germany after the war. Von Neindorff underlined the great importance of a person’s character - which is actually decisive for a true rider. He was always a great example to his pupils in terms of virtues such as modesty, diligence, discipline and responsibility and he was also the last great German equestrian master to acquire international recognition. Nuno Oliveira is the most adored classic rider our times. 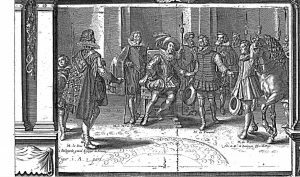 He received his training from Mestre Joaquin Gonzales de Miranda, who served the last Portuguese royal family and passed on the ideals of Marialva. Miranda taught Oliveira that horsemanship is an art, and indeed one which sharpens the rider’s senses for all other things in life. For Oliveira riding was a permanent quest for beauty, straightness and truth. All his knowledge and hopes are to be found in his books, some of which nowadays are also available in German. He had the gift of expressing the wisdom of the ancient masters in modern, easily comprehensible language. His simple and short idiomatic expressions are quite remarkable. Oliveira's impressive seat is the living proof that the often incomprehensible expression “small of the back” actually does exist. His elegance and lightness are legendary, his brilliance was, above all, in the gift of being able to collect and balance totally untrained horses within a short time. He achieved similar feats of success in teaching the piaffe, passage, etc. In a way he is the concluding link in the circle of “workaholic” equestrian masters, working 15 horses a day was quite usual. It was Oliveira who coined the phrase: “art is not a contest; art is love”. Col. Taton, past master of Saumur, described him as a “… real master of the old Versailles school”.